We’ve been running a reading group on Reinforcement Learning (RL) in my lab the last couple of months, and recently we’ve been looking at a very entertaining simulation for testing RL strategies, ye’ old cat vs mouse paradigm. There are a number of different RL methods you can use / play with in that tutorial, but for this I’m only going to talk about Q-learning. The code implementation I’ll be using is all in Python, and the original code comes from one of our resident post-docs, Terry Stewart, and can be garnered from his online RL tutorial. The code I modify here is based off of Terry’s code and modified by Eric Hunsberger, another PhD student in my lab. I’ll talk more about how it’s been modified in another post. For those unfamiliar, the basic gist of Q-learning is that you have a representation of the environmental states s, and possible actions in those states a, and you learn the value of each of those actions in each of those states. Intuitively, this value, Q, is referred to as the state-action value. So in Q-learning you start by setting all your state-action values to 0 (this isn’t always the case, but in this simple implementation it will be), and you go around and explore the state-action space. After you try an action in a state, you evaluate the state that it has lead to. If it has lead to an undesirable outcome you reduce the Q value (or weight) of that action from that state so that other actions will have a greater value and be chosen instead the next time you’re in that state. Similarly, if you’re rewarded for taking a particular action, the weight of that action for that state is increased, so you’re more likely to choose it again the next time you’re in that state. Importantly, when you update Q, you’re updating it for the previous state-action combination. You can only update Q after you’ve seen what results. Let’s look at an example in the cat vs mouse case, where you are the mouse. You were in the state where the cat was in front of you, and you chose to go forward into the cat. This caused you to get eaten, so now reduce the weight of that action for that state, so that the next time the cat is in front of you you won’t choose to go forward you might choose to go to the side or away from the cat instead (you are a mouse with respawning powers). Note that this doesn’t reduce the value of moving forward when there is no cat in front of you, the value for ‘move forward’ is only reduced in the situation that there’s a cat in front of you. In the opposite case, if there’s cheese in front of you and you choose ‘move forward’ you get rewarded. So now the next time you’re in the situation (state) that there’s cheese in front of you, the action ‘move forward’ is more likely to be chosen, because last time you chose it you were rewarded. Now this system, as is, gives you no foresight further than one time step. Not incredibly useful and clearly too limited to be a real strategy employed in biological systems. Something that we can do to make this more useful is include a look-ahead value. The look-ahead works as follows. When we’re updating a given Q value for the state-action combination we just experienced, we do a search over all the Q values for the state the we ended up in. We find the maximum state-action value in this state, and incorporate that into our update of the Q value representing the state-action combination we just experienced. For example, we’re a mouse again. 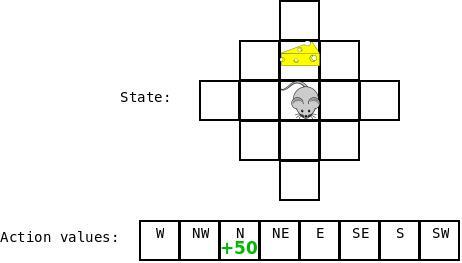 Our state is that cheese is one step ahead, and we haven’t learned anything yet (blank value in the action box represents 0). So we randomly choose an action and we happen to choose ‘move forward’. Now, in this state (we are on top of cheese) we are rewarded, and so we go back and update the Q value for the state ‘cheese is one step ahead’ and the action ‘move forward’ and increase the value of ‘move forward’ for that state. Now let’s say the cheese is moved and we’re moving around again, now we’re in the state ‘cheese is two steps ahead’, and we make a move and end up in the state ‘cheese is one step ahead’. Now when we are updating the Q value for the previous state-action combination we look at all the Q values for the state ‘cheese is one step ahead’. We see that one of these values is high (this being for the action ‘move forward’) and this value is incorporated in the update of the previous state-action combination. Specifically we’re updating the previous state-action value using the equation: Q(s, a) += alpha * (reward(s,a) + max(Q(s') - Q(s,a)) where s is the previous state, a is the previous action, s' is the current state, and alpha is the discount factor (set to .5 here). Intuitively, the change in the Q-value for performing action a in state s is the difference between the actual reward (reward(s,a) + max(Q(s'))) and the expected reward (Q(s,a)) multiplied by a learning rate, alpha. You can think of this as a kind of PD control, driving your system to the target, which is in this case the correct Q-value. Here, we evaluate the reward of moving ahead when the cheese is two steps ahead as the reward for moving into that state (0), plus the reward of the best action from that state (moving into the cheese +50), minus the expected value of that state (0), multiplied by our learning rate (.5) = +25. Almost. There are a couple of additional things we need to add. First, we need to cover the case where there are several actions that all have the same value. So to do that, if there are several with the same value, randomly choose one of them. This helps us out of that situation, but now if we ever happen upon a decent option, we’ll always choose that one in the future, even if there is a way better option available. To overcome this, we’re going to need to introduce exploration. The standard way to get exploration is to introduce an additional term, epsilon. We then randomly generate a value, and if that value is less than epsilon, a random action is chosen, instead of following our normal tactic of choosing the max Q value. The problem now is that we even after we’ve explored all the options and we know for sure the best option, we still sometimes choose a random action; the exploration doesn’t turn off. There are a number of ways to overcome this, most involving manually adjusting epsilon as the mouse learns, so that it explores less and less as time passes and it has presumably learned the best actions for the majority of situations. I’m not a big fan of this, so instead I’ve implemented exploration the following way: If the randomly generated value is less than epsilon, then randomly add values to the Q values for this state, scaled by the maximum Q value of this state. In this way, exploration is added, but you’re still using your learned Q values as a basis for choosing your action, rather than just randomly choosing an action completely at random. Very pleasingly, you get results comparable to the case where you perform lots of learning and then set epsilon = 0 to turn off random movements. Let’s look at them! As you can see, the performance now converges around 300, instead of 100. Not great. And again we get that nice convergence to 100, but this time without having to manually modify epsilon. Which is pretty baller. And that’s it! There is of course lots and lots of other facets of exploration to discuss, but this is just a brief discussion. If you’d like the code for the cat vs mouse and the alternative exploration you can access them at my github: Cat vs mouse – exploration. To alternate between the different types of exploration, change the import statement at the top of the egoMouseLook.py to be either import qlearn for the standard exploration method, or import qlearn_mod_random as qlearn to test the alternative method. To have epsilon reduce in value as time goes, you can uncomment the lines 142-145. I think I might have a Matlab tutorial that would be of interest to you, if you email me I can forward the file to you! i would be interested in the matlab tutorial for non-deterministic qlearning as well!. I would be grateful if you could send it at my email. Could you send the tutorial to me, please? can i have it too? this is a great tutorial btw! I have just stared to explore Q-learning, may this tutorial helpful to me, Thanks! Thanks, this is nice for beginning to explore RL, without dealing with its full complexity at once. The GUI is neat. I’d like to fork a branch of it on Github, add some comments to the code, etc. But your repo contains other directories which makes forking a bit inconvenient. Anyway I have copied the code manually. Thanks again! Ah yeah, sorry about that! But glad you’re finding the tutorial / code useful. Please keep me updated on your work with it! I’d be interested to see any extensions. If you have a python code for Q-Learning, can you send it to me as well?? Hello, I just have the code that I link above up on my github! Many thanks, it was great. Can I have that Matlab tutorial, as well? BTW, it seems that the right side of figure labeled “Q moves near cheese” is not correct. I think both cheese and mouse should be placed one place upper than their current places. Ah! That would be the case if the map was representing things in an allocentric (world or absolute coordinates) way, but here everything is displayed relative to the mouse (egocentricly). When the mouse moves up the cheese is now only one square away from him, and the figure reflects this. I’m actually working on another post about the difference between allocentric and egocentric, I’ll let you know when it’s up! Excellent tutorial and introduction to a potentially complicated subject – well done! Hi, it is excellent material! If it is not too late, can you also send me the matlab tutorial? Thanks! Sure can, just send me your email address! Hi, I would be interested in the Matlab tutorial as well! I would be grateful if you could send it to my email. I sent you my request to your e-mail. Thanks! Great work! I’m a PhD student at University of South Australia, and have looked at SPAUN and your Python implementation of it too. Is it possible to get your MATLAB code for this? Could I please get for the Matlab tutorial on non-deterministic Q-learning? Your explanation is really good. I am really novice in q-learning and was confused about how to set the exploration value (epsilon). If it does not inconvenience you, could you send me the MATLAB tutorial as well, please? First of all, great tutorial, super useful explanations! Thank you very much for sharing. 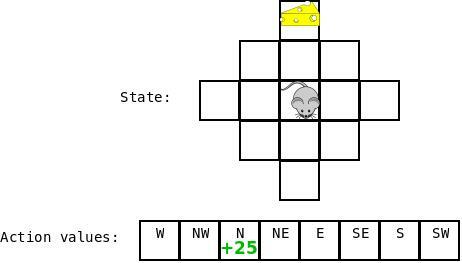 Secondly, in q-move-into-cheese.jpeg, the mouse actually moves upward, so he lands where the cheese was… I think you moved the cheese into the mouse’s tile. Or I am missing something? Please continue posting, your skills are helping us a lot! Nevermind! I guess that diamond shows the current position of the mouse and its surrounding tiles. Glad you found the tutorial useful! Could you please send me the matlab tutorial please? Is that possible to give dynamic rewards in Q-learning? yup. One of the most basic tasks you can do with RL is the bandit task (https://en.wikipedia.org/wiki/Multi-armed_bandit) and the reward changes over time. The speed of convergence depends on your learning rate. If you have a deterministic reward (i.e. not probabilistic) then the amount of noise in the system will determine how high you can crank this. The more noise in your reward the lower you need to keep the learning rate because you don’t want to fully change your Q-value based on noise. Hope that helps! Thank you very much for your explanation on my earlier question. I got another concern regarding Q-learning. For an example,I have to navigate a robot to reach a specific point. But i have time constraints, where robot needs to reach the point within specific time period(e.g.10sec). How and at which point that i need incorporate this constrain in my Q-learning algorithm? if you want to address this kind of problem with Q-learning, then you can do things like just restart the simulation after 10 seconds have gone by, or move the agent back to the start (but that can introduce some undesired artifacts). Q-learning normall assumes an infinite-horizon, but there are variations like average reward RL that remove time dependency (http://citeseerx.ist.psu.edu/viewdoc/download?doi=10.1.1.28.3423&rep=rep1&type=pdf). If you’re not tied to Q-learning, then in general for a finite horizon control problem I would use something like iterative linear quadratic Gaussian control (iLQG; http://maeresearch.ucsd.edu/skelton/publications/weiwei_ilqg_CDC43.pdf) or policy improvement with path integrals (PI2; http://www.jmlr.org/papers/volume11/theodorou10a/theodorou10a.pdf). Great tutorial here. I have a little confusion about the code tho: for printV function in qlearn.py, a single state can be split in form of x, y, a two element tuple. Whereas I looked into egoMouseLook.py, the state is encoded as a tuple of cellValues, which is in turn dependent on cells in lookcells. Number of elements in lookcells is definitely more than 2 according to your implementation, so the state should be encoded as a tuple of more than 2 elements. So why is the split x,y in qlearn.py possible? Wouldn’t that lead to an error in unpacking of tuple? Oh my that is a holdover print function from an allocentric based version of q-learning, sorry about that! You’re the first to catch that one. Those functions aren’t actually used anywhere, which is why no errors threw. I’ve taken them out now, thanks for the catch! I got a very basic question about training and implementation of the Q-learning agent. Initially, we need to train the agent in a simulation environment. So, what are the factors we need to consider at the training phase? Do we need to run separate simulations for a single agent, varying the arrival time to the system? sorry about the delay in replying! This got buried. There’s definitely no hard and fast rules about best practices, it can vary greatly depending on the specific problem. I’m not sure I understand what your context is for ‘varying the arrival time to the system’, could you elaborate on your set up? And how you would change the time an agent arrives in the system inside a single simulation? In general, depending on the problem, and what you want to train specifically, either running a single long simulation to train or a bunch of shorter ones can be appropriate. Hi, I’ve recently started exploring machine learning and then RL. I would much appreciate if you can help me with MATLAB Code/Tutorial for Q-Learning. I’m actually trying to use it in wireless communication area but right now I’ve no idea how to use it in practice. I’m sorry looks like I somehow missed this comment, if you send me an email tdewolf@uwaterloo.ca with some more details I can try to help you out. Hello! It seems like there’s some code missing from the last code box (after random.random()). Can you update if possible? I’m not sure why it wouldn’t appear in full for you! But you could also check out the code on my github if it’s not displaying for you here! Found it on github, thank you! Does Reinforcement Learning(Q-learning) using lookup table (instead of function approximation) is EQUAL to Dynamic programming ? Dynamic programming is really more of an implementation detail, where you store the solution to sub-problems in a lookup table. So RL can be implemented using dynamic programming, but you wouldn’t say RL with a lookup table is the same as dynamic programming, does that help? Specifically we’re updating the previous state-action value using the equation: Q(s, a) += alpha * (reward(s,a) + max(Q(s’) – Q(s,a)) where s is the previous state, a is the previous action, s’ is the current state, and alpha is the discount factor (set to .5 here). Specifically we’re updating the previous state-action value using the equation: Q(s, a) += alpha * (reward(s,a) + max(Q(s’)******)***** – Q(s,a)) where s is the previous state, a is the previous action, s’ is the current state, and alpha is the discount factor (set to .5 here). The article is very good, let me preliminary understanding the concept of q learning, to further deepen the understanding.